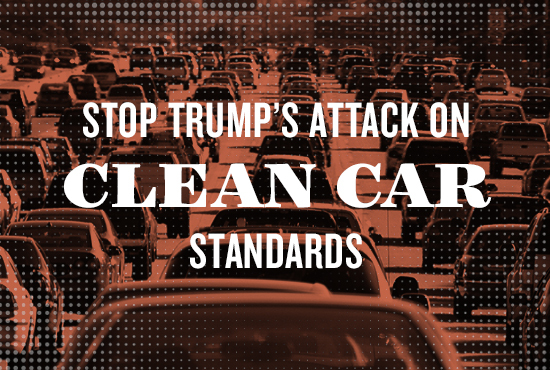 Tell the EPA and DOT to Stop Trump's Attack on Clean Car Standards! President Trump is attacking yet another critical environmental safeguard. He's trying to roll back clean car standards — lifesaving measures that would nearly double the fuel efficiency of automobiles and drastically reduce carbon pollution from cars and trucks if left in place. Clean car standards are at the heart of U.S. efforts to fight climate change and global warming. They’re also good for drivers, manufacturers, and the economy. Rolling them back would be disastrous across the board. Thankfully, the EPA and DOT are accepting public comments on this dangerous rollback plan. Tell them to put a stop to the Trump administration’s climate-wrecking scheme and help NRDC reach its goal of 150,000 comments. President Trump is trying to roll back lifesaving clean car standards, which would nearly double the fuel efficiency of automobiles and drastically reduce carbon pollution if left in place. The EPA and DOT are accepting public comments on this dangerous rollback scheme. Tell them to put a stop to Trump’s climate-wrecking plan and help NRDC reach its goal of 100,000 comments. Dear Administrator Wheeler and Secretary Chao: I urge you to put a stop to President Trump's plan to roll back lifesaving clean car standards. By even considering a rollback of the current clean car standards, both the EPA and DOT are failing to fulfill their missions to protect our climate, defend clean air, and reduce America's dependence on dirty fossil fuels. Transportation is now the single-largest source of carbon pollution in the United States. Strong clean car standards have already reduced millions of tons of carbon pollution from our environment, and would reduce billions more if left in place. Maintaining these common-sense standards is one of the most crucial things we can do to fight climate change and protect clean air. We also know, and research has proven, that strong clean car standards are good for public health, save drivers money at the pump, and keep America's auto industry competitive. I also urge you to maintain California's decades-old waiver rule that allows the state to maintain stronger auto emission standards than the federal government requires -- bold pro-environment leadership that 12 other states have decided to follow. California lawmakers should be allowed to chart their own course on environmental protections. Please keep strong clean car standards in place and fulfill your agency's mission. Thank you.